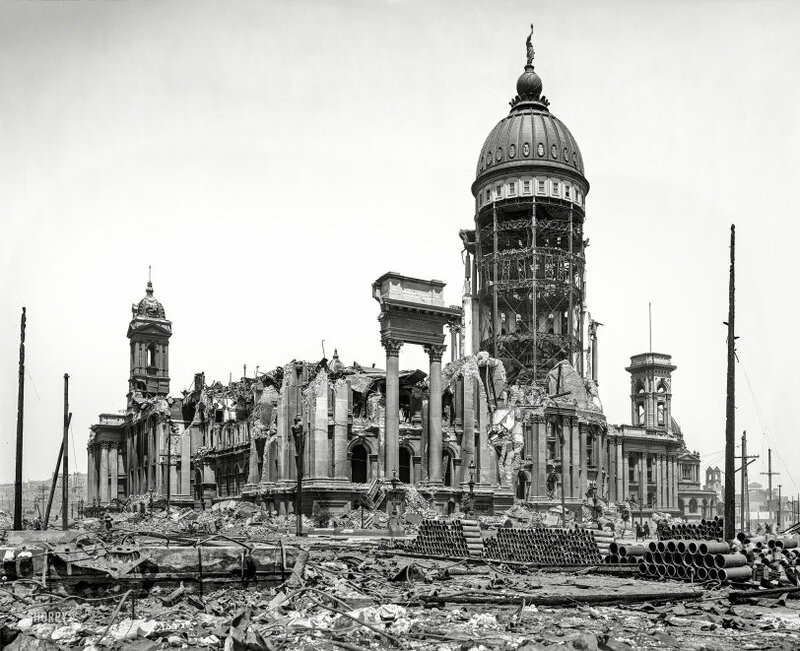 "Ruins of San Francisco City Hall following earthquake and fire of April 1906." 8x10 inch dry plate glass negative, Detroit Publishing Company. View full size. Submitted by StanFlouride on Sun, 04/22/2018 - 8:47am. One of the reasons the building was so badly damaged was that though he was paid for inland sand the contractor used beach sand which was still quite salty. When the heat of the fire and the water from the firefighters' hoses combined the salt expanded and the mortar between the bricks exploded. The domed building behind it on the left was the Annex which contained all the building records and to this day it is impossible to figure an exact date of anything constructed before 1906. Submitted by KAP on Sat, 04/21/2018 - 7:10pm. Really interesting that a thousands year old architectural design is one of the few things still standing, the Corinthian columns still supporting the beam and the cornice.